For travelers seeking a bit of excitement, ziplining is the perfect opportunity to explore the various landscapes of Maui, all while having a blast with friends or family. With top notch equipment, exotic locations and quality safety standards, we highly recommend ziplining during your next trip to Maui. Does it really get any cooler than ziplining down the slopes of the largest dormant volcano in the world? Located on Piiholo Ranch in Upcountry Maui, Piiholo Zipline offers several ziplining tour options over the forest, gulches and meadows of their stunning property. Not only do they offer the longest side-by-side zipline on Maui, allowing you to race other members of your party, but canopy treetop zipline tours with an aerial bridge, tree platforms and tree houses, as well as combo tours with waterfall hiking and swimming, and the standard 4 and 5 line ziplining tours. With technology that doesn’t require you to use your hands to stop yourself, friendly service, and panoramic views from the slopes of Haleakala Volcano, Piiholo Zipline is a great choice for those in search of an epic land adventure. For more information, please visit Piiholo Zipline or call 808.572.1717. Centrally located at the expansive Maui Tropical Plantation in Waikapu, Maui Zipline is the ideal activity for those looking for a midday thrill. With previous guests ranging from 5 to 88 years old, this family-friendly ziplining course is an amazing multigenerational adventure for all members of your group. Begin the tour with a scenic walk through the Plantation grounds before ascending to the first observation deck for views of the unique Maui landscape. Experienced guides offer valuable information on the surrounding floor and fauna, and the 5 line ziplining tour includes side-by-side lines ranging from 300 to 900 feet, all over the lush landscape of central Maui. The tour concludes with a final zip over the sparkling lagoon into a tree house, though we recommend grabbing a bite at the amazing Mill House Restaurant afterwards! 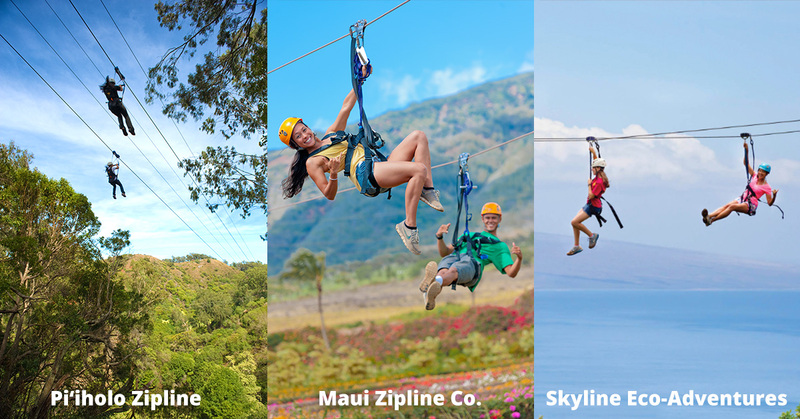 For booking, please visit Maui Zipline Company or call 808.633.2464. If you plan on staying in West Maui, Skyline’s ziplining eco-adventures are a convenient and exhilarating way to explore this scenic area of Maui. Their tours include amazing panoramic ocean, mountain and neighbor island views, with seasonal waterfalls and the only tour at a natural mountain pool. Choose from the 8 line tour through the West Maui Mountains, 4 line Zip n’ Dip Tour, or 9 line option with a double racing line. We particularly enjoyed the 1,000 foot overlook from the valley of Kahalawai Mountain, variety of excellent food, and great staff service. Guests must be at least 10 years or older. For more information, please visit Skyline Eco-Adventures or call (808) 745-1323.